CRAPTASTIC: Five Feature Friday #31! After weeks of beautiful Spring weather it is rainy and cool outside. Maybe that will keep some of the pollen at bay, allergies have been awful this year! I spent yesterday evening beating the crap out of a pallet that has been sitting in my garage for months! I'm not gonna lie, it felt good to take a hammer to that beast. I washed it and got it all clean so I could work on it today, and it got rained on. Drat! So I'll have to wait another day to let it dry before I can start on it. Don't forget, tomorrow marks the beginning of Spring into Spring week with Jane from Adventures in Dinner! I'll be wrapping up the week on Friday! Hope you all get a chance to check it out! June & Bear shared her amazing dining room! I love the industrial chairs mixed with the teal/silver chairs and coral! The Loud Silence enlisted the help of a friend to build her the perfect cubby space, which she then painted in some awesome colors! Love how it brightens up her space! Okay, so it's no secret that Ashely from Domestic Imperfection is one of my real-life buds! 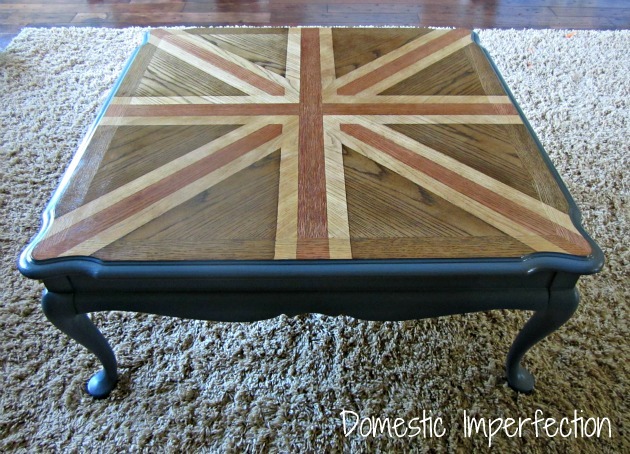 I've been DYING to do a mutli-tone wood look, so I squealed a little when I saw her union jack coffee table done with different shades of stain. Love it! Tina's Crafty Ideas revamped this boring old side table in ultimate cuteness! I absolutely adore the shade of green she chose - and stop by to check out how she fixed up the inside of the drawer! Mak and Jill made my heart flutter when I saw this. I love the mixture of colors and the distressing on this piece! Great job! 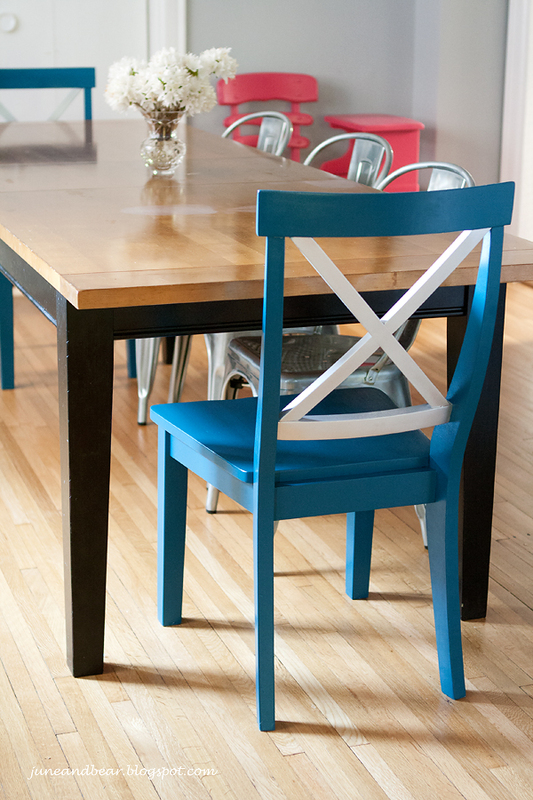 thanks so much for featuring my teal chairs. it has definitely given me the motivation to complete that room. off to check off some more of your features. Thank you for the feature of my little green table. All of the features are great. Have a great weekend. awesome features! i think that stained jack is pretty freaking cool. Thank you so much for featuring my shabby piece! Love your blog. Look forward to more!